On October 4, 2010, some astronomers announced that asteroid 21 Lutetia may be covered by a 2,000-feet (600-meter) deep layer of dusty debris generated by billions of years of meteorite impacts (Jonathan Amos, BBC News, October 4, 2010). This conclusion was derived from data and images gathered by the ESA's Rosetta orbiter which passed near the asteroid on July 10, 2010, while on its way to delivering the Philae lander on comet Churyumov-Gerasimenko in 2014. 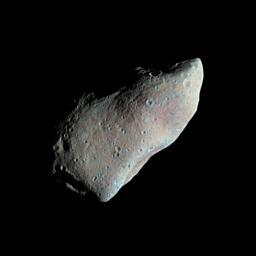 Of uncertain composition with unusual surface colors and without traces of metals but many craters, Lutetia looks like a carbonaceous asteroid in some ways, but its reddish color also resembles iron-rich "M-type" asteroids that are thought to be fragments of the cores of much larger differentiated objects. The astronomers anticipate that spectroscopic analysis of infrared data collected by Rosetta will help to identify some of Lutetia's surface minerals. Larger and jumbo image montage. be a type of carbonaceous asteroid (more). The 60-mile (100-kilometer) wide asteriod is much larger than the nine asteroids and four comets that have been previously visited by Human probes. Despite its relatively large size, however, Lutetia does not have enough mass for gravity to shape it into a sphere, unlike Ceres. Sensors and other instruments on Rosetta and its Philae lander also looked for evidence of a highly tenuous atmosphere and magnetic effects, studied the asteroid�s density as well as its surface composition, and may have caught stray dust grains floating in space near the asteroid for on-board analysis (more discussion, images, and video from ESA news release; and Astronomy Picture of the Day). 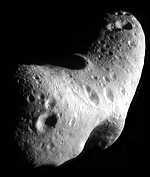 Asteroids are primoridal objects left over from the formation of the Solar System. While some have suggested that they are the remains of a protoplanet that was destroyed in a massive collision long ago, the prevailing view is that asteroids are leftover rocky matter that never successfully coalesced into a planet. Most planetary astronomers still believe that the planets of the Solar System formed from a nebula of gas and dust and ices that coalesced into a dusty disk around the developing Sun. Within the disk, tiny dust grains (and ices in the colder environs beginning around two AUs inside of Jupiter's orbit) coagulated into larger and larger bodies called planetesimals, many of which eventually accreted into planets over a period as long as a 100 million years. However, beyond the orbit of Mars, gravitational interference from Jupiter's huge mass prevented protoplanetary bodies from growing larger than about 1,000 km (620 miles), by sweeping many into pulverizing collisions as well as out into the Oort Cloud or beyond Sol's gravitational reach altogether. at the Minor Planet Center. loose rubble pile with the density of water. It has been estimated that the total mass of the Main Asteroid Belt may total less than 1/1000th of the mass of the Earth. Indeed, if all asteroids down to the size of meter- or yard-sized boulders or less were combined together, the resulting object would measure less than 1,300 to 1,500 km (810 to 930 miles) across, which is less than one third to one half the diameter of the Earth's Moon. 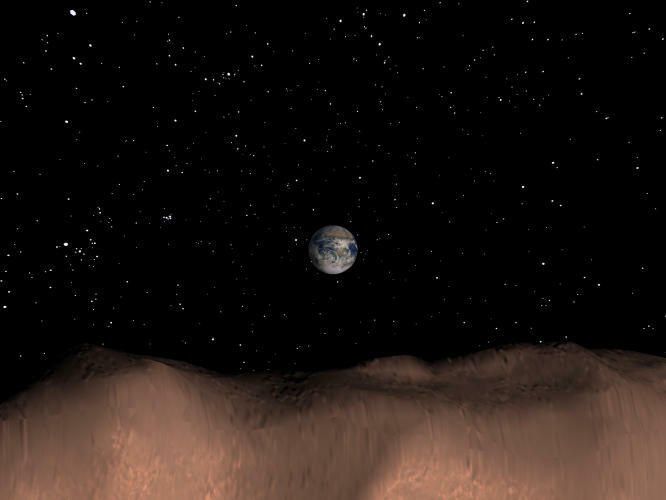 The Main Asteroid Belt is only a small remnant of the material that once resided in the region between Mars and Jupiter, but once may have contained between two to 10 Earth masses of material (Dan Durda, "Ask Astro," Astronomy, December 2000). 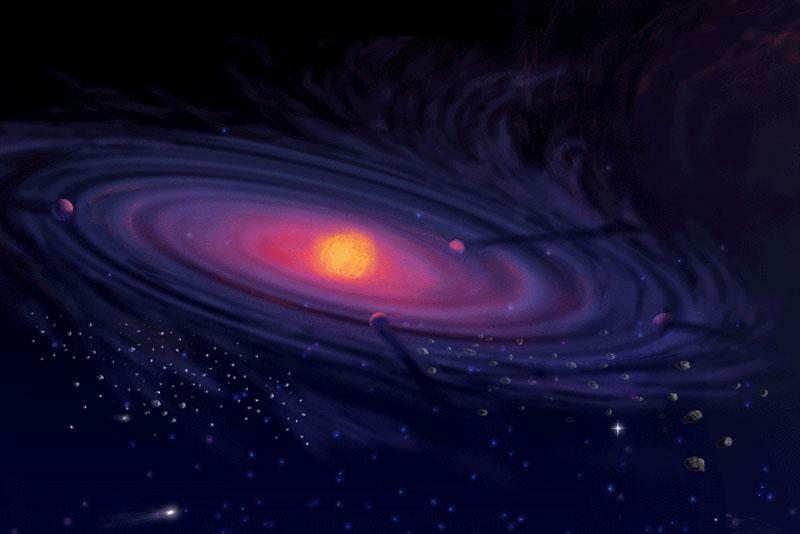 However, T-Tauri-type Solar winds from a very young Sun, gravitational perturbations from Jupiter developing nearby, and dynamic interactions with other large planetesimals and protoplanets during the first 100 million years, and continuing collisional grinding over the following 4.5 billion years after the formation of the planets, interfered with the formation of a substantial, single planet and caused most of the mass to be lost to the rest of the Solar System and interstellar space. substantial planet in the Main Asteroid Belt. Based on the composition of meteorites found on the Earth, most asteroids may be composed of three materials: mostly (92.8 percent) silicates (stone); metals (5.7 percent) iron and nickel; and the rest as a mix of the those materials and carbon-rich substances. Asteroids located closer to Mars and Earth that exhibit the same spectra are composed of rocky minerals ("stone") mixed with iron. 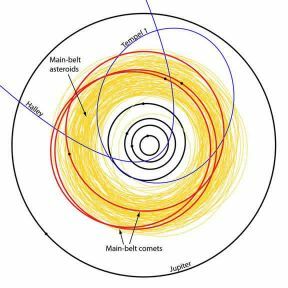 In contrast, asteroids located farther away from the Sun on the Jupiter side of the Main Asteroid Belt are generally darker, redder, and more icy, presumably because they were not as well heated by the Sun and so have a composition more like the primordial, circum-Solar dust disk out of which the outer planets accreted about 4.5 billion years ago. Thus, the outer asteroids may more closely resemble the icy planetary bodies of the Edgeworth-Kuiper Belt and Oort Cloud. The larger asteroids or protoplanets may have accumulated enough internal heat to "differentiate," whereby denser metals settled downwards (and perhaps even form metallic cores) and left lighter rocky ("stoney") residues in their outer layers. On some asteroids, internal heat may also have formed metamorphosized rocks, and volcanoes may even have erupted. Although no asteroid in the Main Belt grew big enough to hold on to an atmosphere, minerals found in some meteorites suggest that liquid water was often present. The near-Earth asteroid Eros is made of material that has not been much altered since its accretion from the circum-Solar dust disk 4.5 billion years ago, never subjected to the melting and separation of its materials into distinct layers -- e.g., differentiated into metallic core, mantle, and crust -- as happened with the four inner planets (Earth, Mars, Venus, and Mercury). With an uniform density like the Earth's crust, it is probably a fractured chip off a larger body, perhaps another asteroid. Eros is roughly the size of Manhattan, NYC, USA (see APOD 2001 and APOD 2009). As Jupiter accreted into a giant planet, its gravitational pull began to disturb the orbits of the nearest planetesimals so that collisions became more violent. 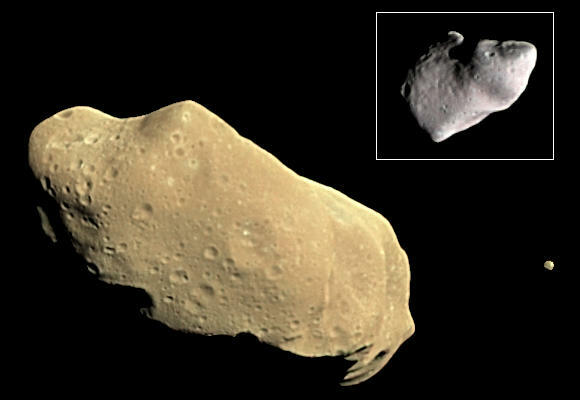 As a result, the larger, differentiated protoplanets tended to be shattered into smaller asteroids, and so many asteroids are believed to have formed from their rocky or metallic debris based on spectral analysis of meteorites that landed on Earth. In contrast, the asteroids found farther out are thought to be made from planetary bodies that are less well differentiated, if at all, as well as having a much higher ice content. 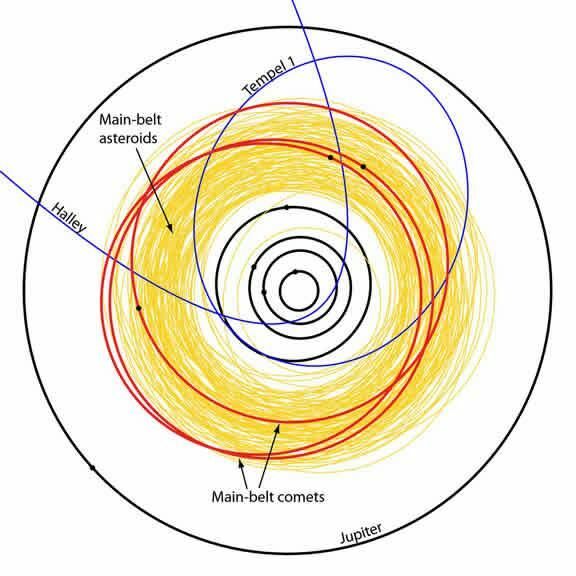 On March 22, 2006, astronomers (including David Jewitt and Henry Hsieh) announced that the near circular orbits of some icy asteroids in the outer reaches of the Main Asteroid Belt suggest that they are part of a population of "main belt comets." Three objects have been found with near circular, flat orbits in the main belt occasionally stream volatile materials, producing an observable tail for weeks and months at a time as their orbits bring them closer to the Sun. The astronomers speculate that past impacts on Earth from such inner comets may have been an important source of the water now found in Earth's oceans (IFA press release and web site on main-belt comets; and Jewitt et al, 2006). Flyover of 433 Eros -- and rotating. and more animations and videos. Near-Earth Objects (NEOs) are asteroids and comets that have been nudged by the gravitational pull of nearby planets into orbits that cause them to enter the Earth's vicinity. In terms of orbital elements, NEOs are asteroids and comets with a perihelion (q) distance less than 1.3 times the Earth-Sun distance (AU). Near-Earth Comets (NECs) are further restricted to include only short-period comets -- that is, with an orbital period (P)less than 200 years. 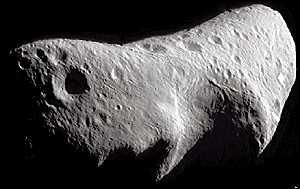 However, the vast majority of NEOs are asteroids, called Near-Earth Asteroids (NEAs). NEAs are subdivided into the Aten, Apollo, and Amor groups (that are categorized by their perihelion distance (q), aphelion distance (Q), and their semi-major axes (a) of orbit) and the Potentially Hazardous Asteriods (PHAs). PHAs are objects that can some day harm life on Earth because of their proximity and size -- Minimum Orbit Intersection Distance (MOID) with the Earth is 0.05 AU or less with an absolute magnitude (H) of 22.0 or brighter. Analysis of data collected by spacecraft sent to a sample of asteroids since the 1990s and estimation of rotation speeds for a large number of asteroids have led to a startling conclusion. As of late 2001, no known asteroid larger than 200 meters (656 feet) across has been found to rotate faster than once every 2.2 hours. As a result, planetary astronomers infer that, over time, repeated collisions appear to have reduced most asteroids larger than a couple hundred meters (or yards) into "rubble piles" that are only loosely held by their weak gravity, which fly apart if spun too fast. 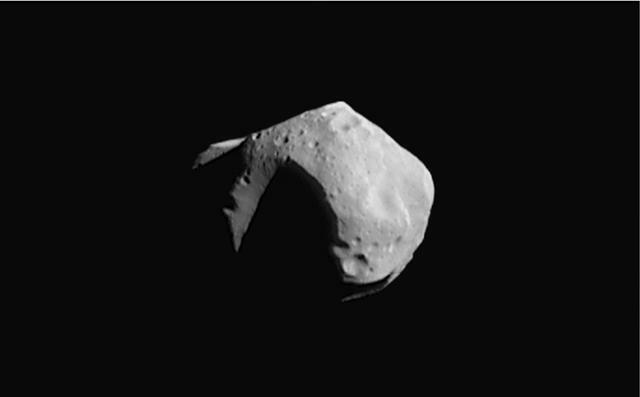 For example, it has been estimated that asteroid Mathilde has a density close to that of water. Smaller asteroids, however, should be solid bodies because the shattered fragments of an asteroidal collision should easily escape their feeble gravity and fly off into space instead of settling back on their surface as regolith. Try the Orbit Viewer, originally written by Osamu Ajiki of AstroArts and modified by Ron Baalke of NASA's Jet Propulsion Laboratory, to see real-time orbit animations of the known asteroids, Edgeworth-Kuiper ice bodies, comets, and planets. Information and images about proposals to mine asteroids (and comets) as economical sources of raw materials for last space construction projects can be found at Sol Station. 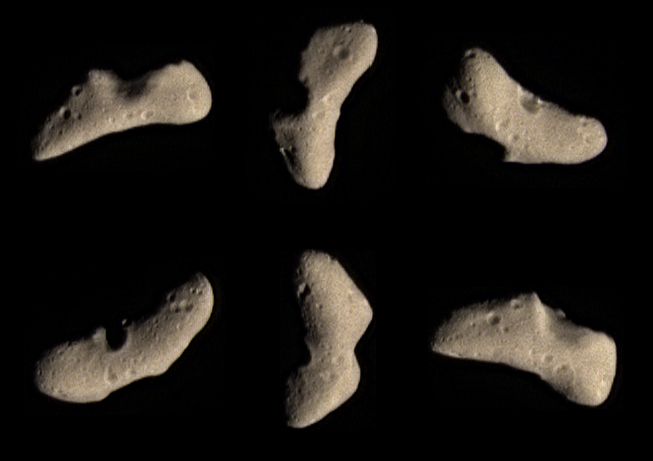 More images of asteroids are available at NASA's Planetary Photojournal. 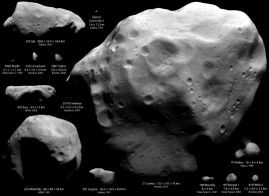 A fact sheet on many asteroids is also available from NASA's National Space Science Data Center. For more information about the Solar System, go to William A. Arnett's website on "The Nine Planets", or to Calvin J. Hamilton's web page: "Asteroid Introduction".